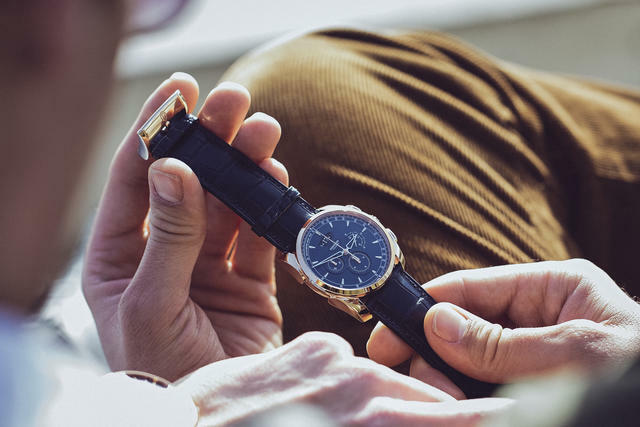 With this newest member of the Tonda collection, Parmigiani Fleurier expands its previously all-steel Tonda Metrographe line. 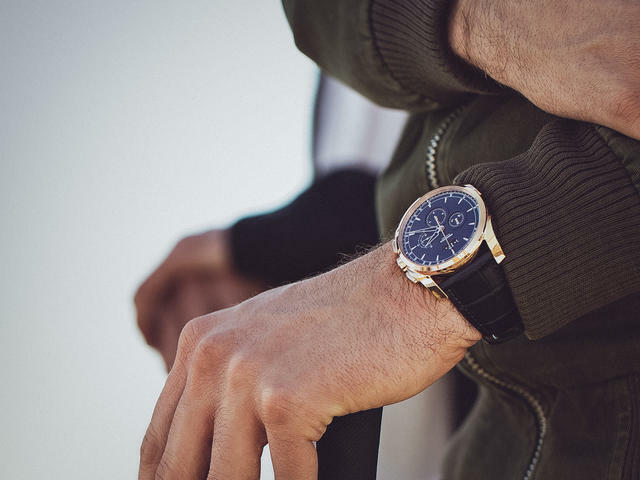 Still a sporty round-cased chronograph, the new model means that the Metrographe collection now includes a dressier rose-gold option, the first precious metal Tonda Metrographe. Matched with a rich blue dial, this latest model retains the collection’s revamped Metrographe dial layout, which we first saw about two years ago. With that redesign, Parmigiani Fleurier essentially made the three-subdial chronograph a bit more mainstream, though with a few caveats. 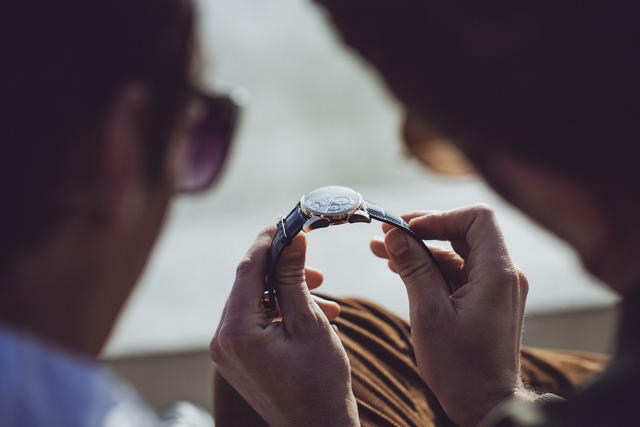 The newer design tones down the original model’s prominent figure-eight pattern connecting the two chronograph subdials. This Tonda Metrographe also shows its curved, multi-date window at 12 o’clock rather than within the chronograph hour subdial at 6 o’clock, and now features smaller hour markers and a tachymeter scale. 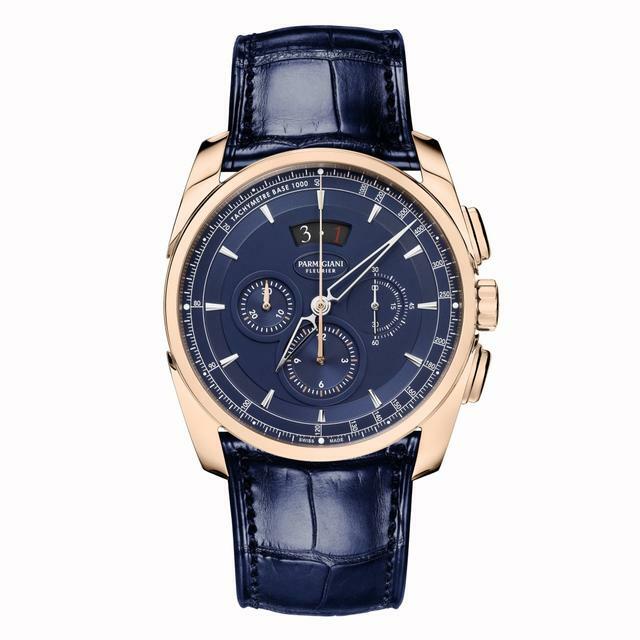 Parmigiani Fleurier Tonda Metrographe, now offered in rose gold case. The newer design also notably replaced a more traditional seconds counter (at 3 o’clock) with two 30-second counters concentrically placed at the right of the dial with seconds indicated by an interesting two-sided seconds hand. Parmigiani Fleurier maintains the Tonda Metrographe’s 40mm diameter case, curved lugs and oval-shaped pushers, though here for the first time in rose gold. In a design flourish not unexpected at this detail-oriented watchmaking company, the oval pusher shape echoes the shape of the Parmigiani Fleurier logo just below the date window. 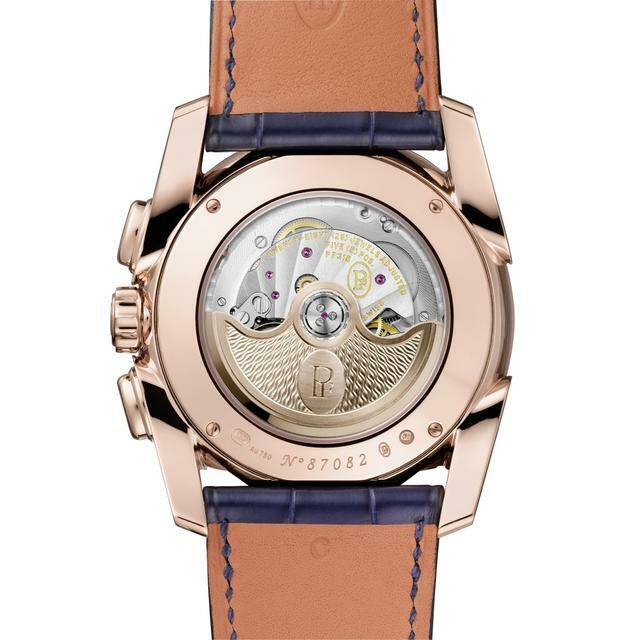 Caseback view, Parmigiani Fleurier Tonda Metrographe, now in rose gold. Price: $29,500. 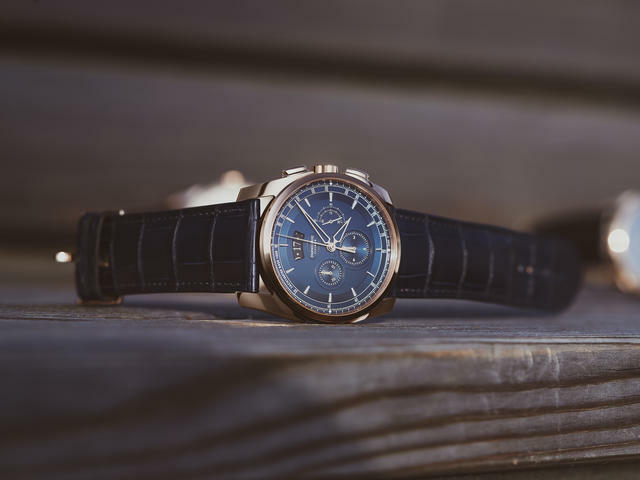 A steel case Tonda Metrographe with the same blue dial will also be available for $11,900 with black calfskin strap or $12,500 with a steel/titanium bracelet. 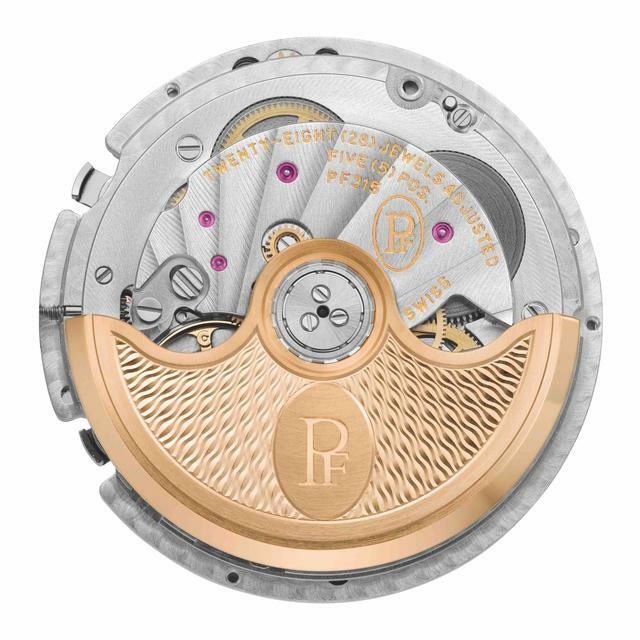 The watch's PF315 automatic movement features a 42-hour power reserve and a 22-karat gold rotor with guilloché finish. Bracelet: Hermes blue alligator strap with 18-karat gold pin buckle.